! No longer in production ! Malt : pils, vienna and wheat Hops : Brewers gold, galaxy, dry hops on admiral and Strisselpalt. Leicht im Weizen mit einer gewissen Hopfennote, dazu etwas Getreide, ein wenig Muffigkeit und eine recht kalte, gerstige Bitterkeit zum Schluss. Antrunk ok, Abschluss etwas gewöhnungsbedürftig. Geht so. Bottle from Calisky - many thanks! 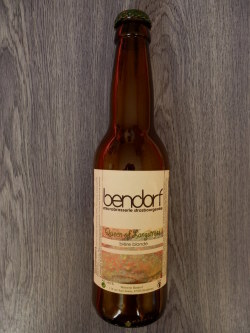 Bottle as " Queen of Langstross - bière blonde". The beer has got a light hazy golden colour with an airy head and medium body. Aroma of hops, wheat and bread. Taste of hops, light malt, bread, light flowers, wheat, flowers and mild citrus fruits. Easy to drink, quite tasty with an high carbonation. Bottle 33cl, a cloudy copper beer without head with yeast floating. Nose is on exotic fruits, aroma is a bit yeast like, fruity on lemon and exotic fruits, grassy bitterness, apricot. Basic apa not impressed but still nice. Slight hazy golden with big white head. Soapy, grassy, citrus and light pine. Light malts. Quite bitter. Very dry and slightly metallic finish. Light bodied. Ok, but a bit too soapy. Bière blonde. Mousse légère et fine. Nez fruité (citron, voir banane) et très légèrement épicé. Entrée de bouche puissante sur les arômes du houblon, j’ai été surpris car au premier abord on ne s’y attend pas étant donné la douceur du nez. Fin de bouche longue et persistance, fortement houblonnée. A noter son caractère léger et désaltérant. Enfin, comme l’autre dégustation de la même brasserie, problème d’équilibrage des saveurs, le houblon trop prononcé va masquer son coté fruité et tout cannibaliser. Botled 33cl. Courtesy of jaghana. Hazy golden with a white head. Yeast, cloves, white wine, hops and wort (?) throughout. Nice dry finish. Presumably not meant to qualify as an APA. Thanks jaghana!